I probably wouldn't have bothered watching the premiere of ABC's new cop show, Castle, if it didn't star Nathan Fillion, but I'm glad I did. While at it's heart, Castle is a police procedural show like so many others, it's twist is interesting enough that I'm looking forward to the next episode. In the show, Fillion plays Rick Castle, best selling author of books along the lines of James Patterson's Alex Cross series (in fact Patterson did a special guest spot with Stephen J. Cannell where they joined Castle for a poker game). 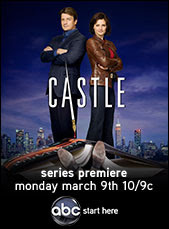 When someone starts using his books as a roadmap for murder, Castle is brought in to help solve the mystery. Along the way he meets detective Bennett, played by Stana Katic and discovers in her the perfect heroine for his next book series. Fillion and Katic have an interesting chemistry, I'm not sure if I believe I love story is right for them or not, but I'm looking forward to seeing how the relationship grows. I watched that show last night, too! I missed the first fifteen minutes since I hadn't planned on watching it. I was excited to see James Patterson in the episode since I used to be a big fan of his books. I'll probably watch next week's episode if I remember.